For anyone searching for a maritime-inspired engagement ring, there is no greater inspiration than the Ocean itself. 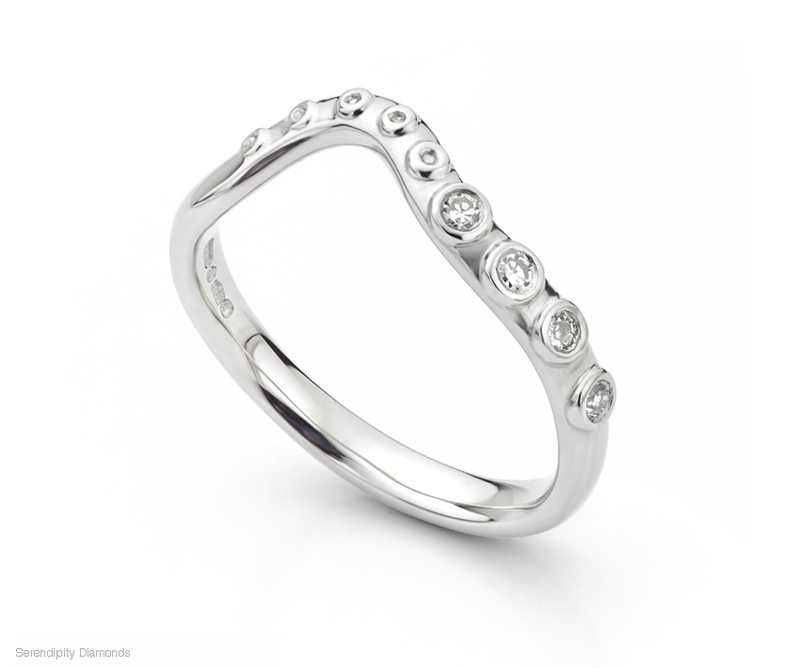 Over the years, we have modelled and crafted a diverse collection of diamond engagement rings. From wave patterned ring styles to designs inspired by marine life. It was therefore fitting that we were approached to create an ‘Octopus styled diamond engagement ring’ that we dubbed the Kraken ring. This name was taken from the mythical giant sea creature featured in ancient tales told by mariners. 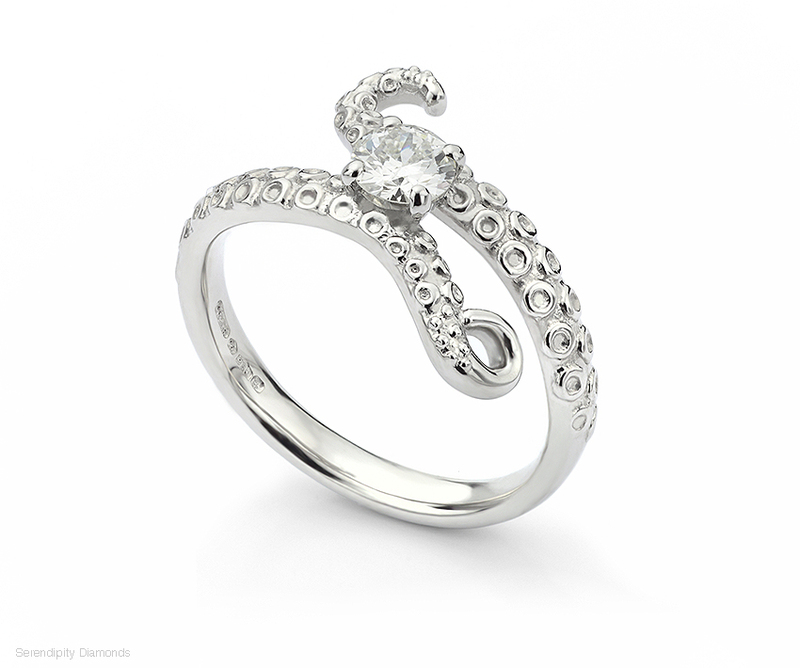 The Kraken engagement ring design was created digitally using CAD design. Following a brief from our client, we provided a detailed quote to create the ring. In addition to the engagement ring itself, we created a matching shaped wedding ring set with diamonds. The Kraken ring was another great example of jewellery re-modelling, where we repurposed diamonds from an existing ring. Recycling is a very big part of the work we do. Working with ethically sourced materials, most of our commissions include recycled or ethically sourced precious metals and gemstones. 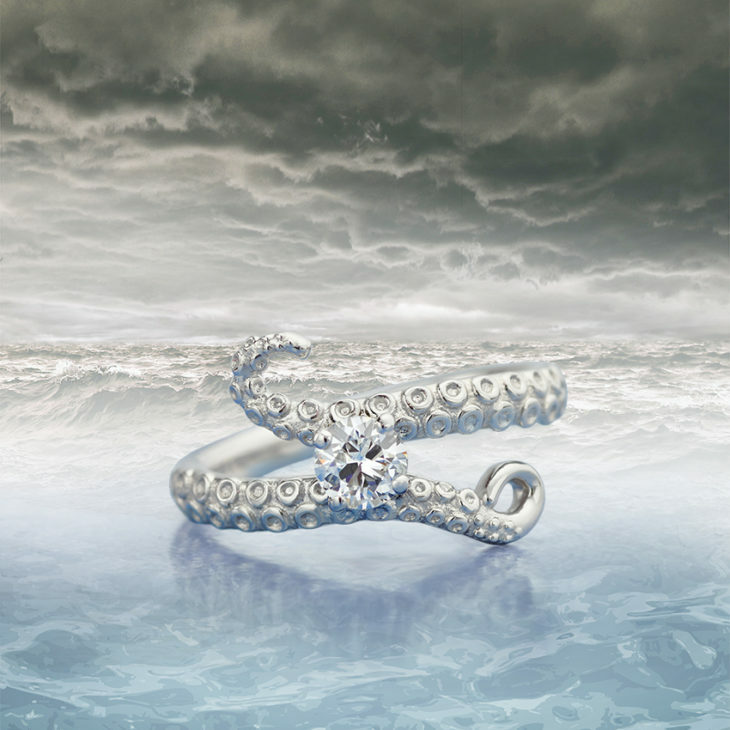 In addition to the larger central diamond, the Octopus themed engagement ring included a matching shaped wedding ring set with smaller diamonds enclosed within each sucker of the tentacle. Another important service offered by our team ensures a perfectly matching wedding ring for any engagement ring. Almost any setting or ring design can be worked around. 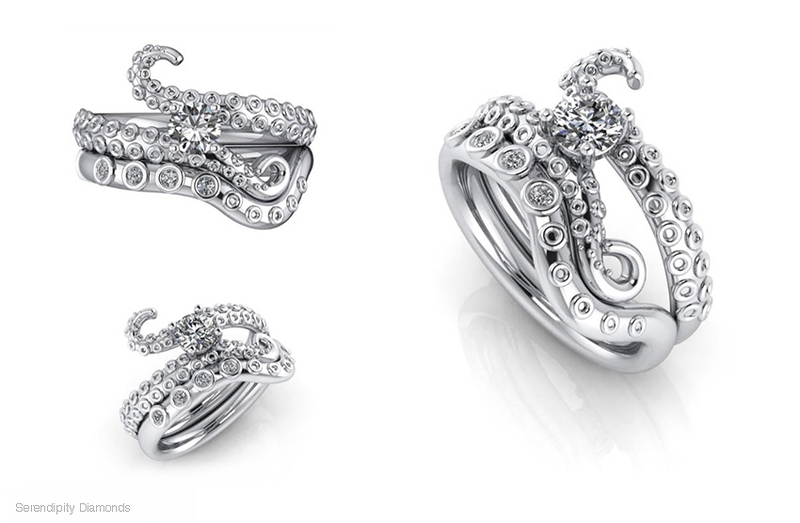 Uniquely styled, the Octopus shaped wedding ring featured re-purposed diamonds and faithfully fits within the Kraken engagement ring design forming a perfect bridal set. You can view more examples of our custom shaped wedding rings on our website. If you have an idea for a custom made engagement ring, it does not necessarily need to be Ocean themed. 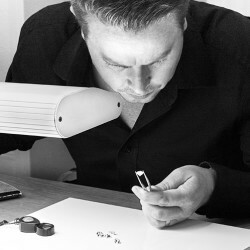 Our experienced, friendly team will guide you from your first contact all of the way through to the completed ring. All information is provided on a no-obligation basis and we work with clients Worldwide. For clients in the UK, we are on-hand in our Ryde showroom where visitors can arrange a one-to-one appointment to discuss their requirements and get expert help.